Have you ever wished for a watch that takes care of itself and still deliver top-notch performance? Citizen’s watches featuring Eco-Drive technology fit the bill real well. 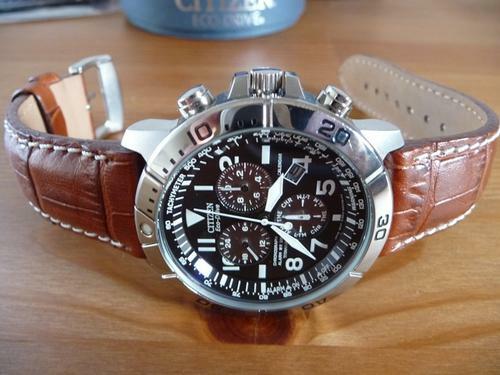 In this instance, it is the Citizen BL5250-02L leather and titanium watch that we’re talking about. Let’s see where the Citizen BL5250-02L fares superbly and where it fares less superbly. I own dozen of watches, from Casio G-Shock to Seiko to Tags. I’ve come to appreciate a watch that is battery-less more and more. If you have seen your few hundreds dollars of watch full of scratches after you sent it for battery replacement, I bet you’d freak out just like me. It happened to my Armorlite ISOBrite ISO100. I’m not usually particular about my watches. But still, the ‘bruises’ my T100 suffered after I sent it for a battery replacement were enough to make me scream. From then on, I always stick to watches that require no battery replacement. Automatic watches are awesome but many at times, I need a watch that I can pick and go without manually setting it. That’s when Citizen’s self-charging Eco-Drive technology comes in very handy. For the curious minds, the video below shows how the much touted Eco-Drive technology works. Citizen’s perpetual calendar feature is something that not many other tough watches can offer. What is it exactly? It is a feature that requires you to set the date once and it will automatically adjust the number of days that go into each month. No more worry about looking at the wrong dates. No more worry about having to adjust to the 28, 29, 30 or 31 days in each month. 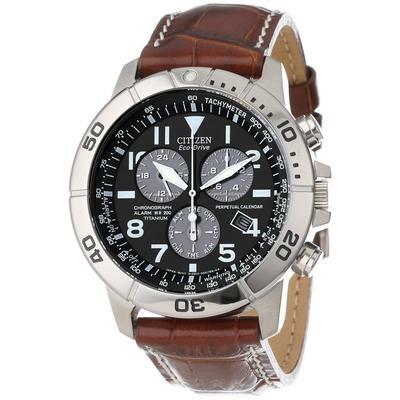 With Citizen BL5250-02L, you only need to set the date once and it will take care of the rest. I rely a lot on my watch to remind myself of current date. This feature has been working flawlessly and I couldn’t be happier. 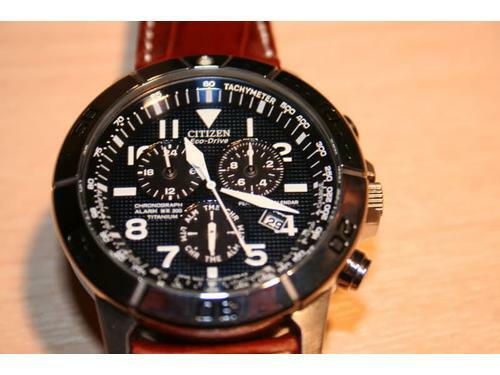 Aside from the date, Citizen BL5250-02L scores high in terms of accuracy. I have few watches that had been accurate during the first few months of use, but starts to drift significantly after that. I’m one who likes to be punctual. Five or ten minutes make a lot of difference. I hate it when I have to keep rewinding my watch every week. Even once in a month is too much! This is not the case for the BL5250-02L. I’ve owned this watch for about a year. It has not required any adjustment so far. The case of Citizen’s most popular Eco-Drive watch is made of Titanium. Titanium is generally more expensive than stainless steel and seen as the ‘cooler’ alternative. Being lighter is another reason why Titanium are increasingly used in higher end watches that are designed for toughness and style. This is the case for the BL5250-02L. It feels so light on my wrist that I tend to forget that I’m wearing it at times. I know not everyone loves their watch to be light. So if you’re looking for a watch with heavier feel on your hand, this might not be the perfect option. The size of the watch is just about right. At 43mm, I’d consider it a properly sized large men’s watch. Not too big. Not too small. At least for the wrist size of average guys. I have a 7.3″ wrist (within the average range) and I found the case and leather band width to be ideal. This watch is my favorite pick if I need a ‘dress’ watch but still maintain the tough and classy look. Talk to any BL5250-02L owner. The first complain you’ll hear is the alarm being too short and too soft. If you’re looking to use this watch as your morning alarm, you’d better look elsewhere. I consider myself a light sleeper and there are still too many occasions where the alarm of this watch failed to wake me up. The second most common dissatisfaction among Citizen BL5250-02L is its bezel being too shiny. In case you’re wondering why being shiny is a sin, it looks more like the cheaper chrome material. No doubt the leather strap attached to this watch is made of heavy duty material. I have it for about a year now and it still looks good. But again, not everyone is keen on leather. Or some like the flexibility of being able to change the bands as they prefer it. If you prefer a metallic bracelet, you may want to forget about getting this watch. The last issue is more of marketing flop rather than product defect. From the description, many buyers (including myself) expect the dial face to be blue. I remember when I first received it, I thought they had sent me the wrong model. It was only after talking to their customer services and going through the watch reviews that I found this to be the norm. The face dial looks more black rather than blue. At least for my case, I have no issue with the black dial. It’s just that they could have done better in their product description. To sum things up, Citizen BL5250-02L is indeed a handsome watch that is made to last. It is not perfect in every sense. But it is close to being flawless especially in areas that matter the most. Go grab it if you need a sturdy watch that will still fit perfectly into your business attire. If your instinct is still holding you back, you may want to take a look at our pick for the best analog watchs in $200 price range.